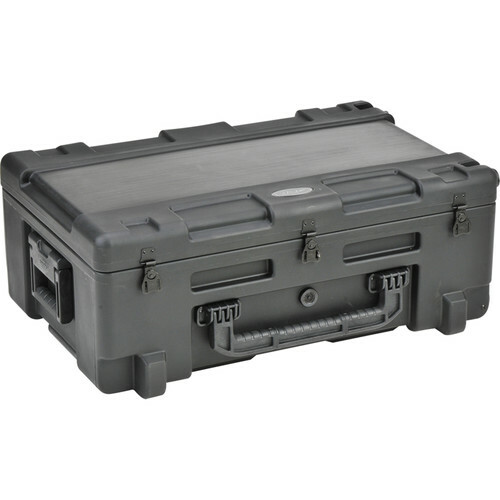 Roto Military-Standard Waterproof Case 10" Deep (W/ Cubed Foam) from SKB is constructed of LLDPE Polyethylene and sealed against dust and water. The case has a hard impact-resistant outer shell and features a pull handle, built-in wheels and durable stainless steel hardware. The inside features cubed foam, designed to provide complete impact protection. Additionally, built-in automatic pressure equalization valves compensate for changes in air pressure. The case is resistant to UV, solvents, corrosion, and fungus, making it an ideal choice for maximum equipment protection at all times. Box Dimensions (LxWxH) 33.5 x 21.5 x 13.0"